KATHMANDU, Dec 26: Stocks extended loss for the second straight day as the Nepal Stock Exchange (Nepse) index maintained negative bias throughout Tuesday's session. The secondary market came under pressure since the beginning of Tuesday's trading, as the index fell shed more than 8 points by mid-session. The index retraced slightly toward the closing hour to end the day 5.71 points down at 1,186.03 points. Following the rally on Sunday, the market saw further correction on Tuesday but is still trading firmly higher for the week. 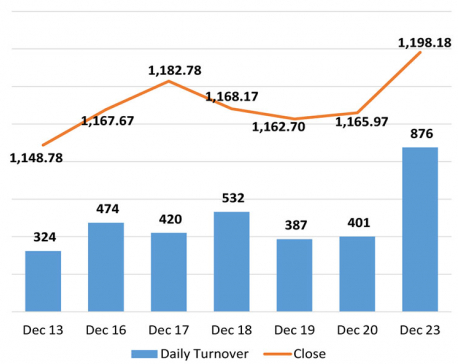 The drop in Nepse on Tuesday was also accompanied by a steep decrease in total turnover. Total daily transaction declined by 47 percent to Rs 421 million. Following the broader index, all sectors closed the day in red. Hotels stocks were the major drag as reflected by a 1.24 percent slump in the group's sub-index. Similarly, Microfinance sub-index also shed 1 percent on the day. Next on the list was Hydropower sub-index which posted a loss of 0.9 percent, while Development Bank and Life Insurance sub-indices sank 0.6 percent and 0.51 percent, respectively. Banking stocks also struggled as the segment's sub-index closed 0.44 percent lower. In terms of market activity, Nepal Investment Bank Ltd posted the highest turnover of over Rs 62 million as the bank is closing its shareholders' book on Wednesday ahead of its Annual General Meeting (AGM). The commercial bank has announced 22 percent cash dividend and 18 percent bonus shares to its shareholders. Nepal Investment Bank Ltd Promoter Shares were also actively traded in the market with total transaction topping Rs 52 million. Similarly, Rs 23 million worth of shares of NMB Bank Ltd were traded on the day. Besides, Prime Commercial Bank Ltd Promoter Share and Nepal Bank Ltd logged turnover of over Rs 19 million each. Similarly, Rs 16 million worth of shares of Hydroelectricity Investment and Development Company changed hands on the day after the company announced 10 percent bonus shares to its shareholders on Monday. Among advances, the share price of Multipurpose Finance Ltd, which fell for seven consecutive sessions, recovered almost 10 percent. Prime Commercial Bank Ltd Promoter Share also saw its share price jump by 6.32 percent, while Civil Laghubitta Bittiya Sanstha Ltd added 4.67 percent on its share price. Additionally, the share price of Prime Life Insurance Company Ltd and Chhyangdi Hydropower Ltd climbed by almost 3 percent on Tuesday. On the other hand, the unit price of NMB Bank Ltd Promoter Share tumbled 9.33 percent. Nagbeli Laghubitta Bikas Bank followed suit as its share price declined by over 5 percent. The micro sector lender, which had announced 16.11 percent bonus shares in November, has now amended stock dividend to 9.37 percent. NMB Bank Ltd, Vijaya Laghubitta Bittiya Sanstha Ltd and Butwal Power Company Ltd were among other losing scrips, posting a decline of 4.49 percent, 3.71 percent and 2.82 percent, respectively. ARKS technical analysis indicates the market consolidating further, forming bearish candlesticks for two days in a row. Nonetheless, the upbeat sentiment still prevails in the market as the market is trending above its support of 1,180 points. Technical indicators also suggest that the momentum is yet to ease off in the present context. However, a fall below 1,180 points might see the index reach the 1,160-point zone.